One of California's fiercest fires on record, the Valley Fire, has destroyed a Lake County winery and forced thousands to flee their homes, but the 2015 wine harvest has so far continued in much of the region, including Napa Valley. Shed Horn Cellars in Middleton, southern Lake County, was burnt down as the California Valley Fire forced state governor Jerry Brown to declare a state of emergency. ‘We are saddened about the loss of our beautiful county and our many friends that have lost their homes,’ Michael and Adawn Wood of Shed Horn Cellars, who lost both their home and their winery, were quoted as telling the Lake County Wine Association. 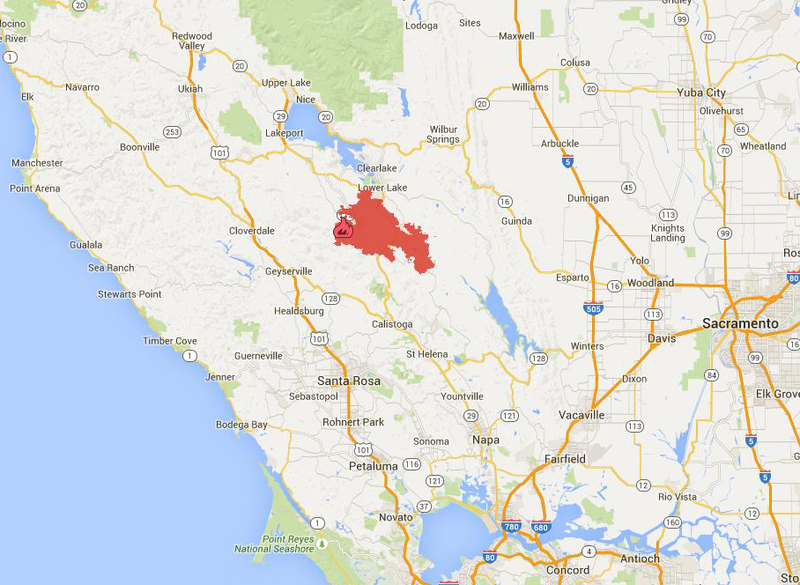 Around 23,000 people were forced to evacuate their homes in Lake County due to the Valley Fire. Fire officials said the fire was 30% contained and had burned through 70,000 acres of land in Lake and Napa counties by early Wednesday 16 September. Debra Sommerfield, president of the Lake County Winegrape Commission, said it was too early to properly assess vineyard damage in the area, but added ‘the main impact has been the closure of Highway 29 in the midst of harvest 2015, which has made it challenging for harvest workers to get to the vineyards’. According to the Napa Valley Vintners, no Napa Valley wineries or vineyards have been burnt by the blaze. The trade body called more than 20 of their winery members to check they are safe. ‘All were safe and sound and busy at work harvesting grapes,’ said Patsy McGaughy, from Napa Valley Vintners. Fears of spoke taint in the wines have also been put to rest for now, as the smoke from the fires has mostly been blowing away from Napa Valley. The wineries, restaurants and tasting rooms in these areas are still open for business and visitors. There is also information on how to help those affected by the fire, including donating to the Red Cross and other organisations. The Valley Fire is the latest in series of wildfires in California this summer. Napa Vintners are keen to show their support for their neighbours. ‘The situation right now is quite tragic for Lake County and we are standing by to help in any way we can,’ added McGaughy.